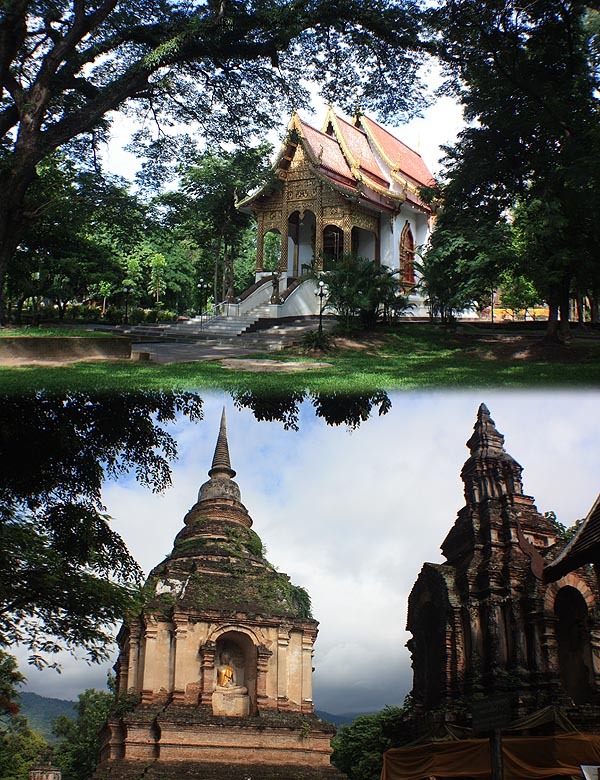 According to Wikitravel, Chiang Mai means “New City” in the Northern Thai dialect, although it’s anything but new. 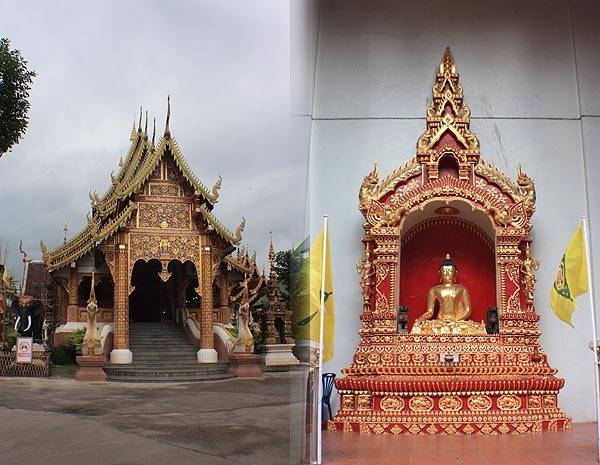 Founded in 1296 CE, it’s one of the oldest cities in Thailand, and probably in SE Asia. And that’s what makes it special. Most towns and cities in Thailand have more Wats than a light bulb, and after a while, you get the feeling that when you’ve seen a few temples, you’ve seen them all. Many around the country are quite new, or even brand new. Although the basic design does not seem to have changed over the centuries, the fact that most in Chiang Mai were built about 600 years ago, makes them extra-special and well worth visiting. If I’m honest, I really hadn’t given myself enough time. In three days, I wanted to see the city and rent a car to see the surrounding, mostly hilly, countryside. Not possible. I didn’t even see everything in the city. A friend in Bangkok had already warned me not to drive, as the recent monsoon rains had washed out many roads and created landslides. He should know me well enough that to me, that means “fun” but I took his advice. Because of this, I was not expecting the weather to be great, and it wasn’t! I lost most of the first day partly due to rain, and partly due to the fact I was also washed out after a 4:30am start to the day. I really must find somewhere I can go on a flight that leaves after 7am! And of course, KLIA’s Low Cost Terminal was at its low cost worst at that time of day. I suppose the most unusual feature of Chiang Mai is the fact the original city is enclosed by a wall and a moat. The old city is square, with each wall being about 1.5kms long, so getting around requires a lot of walking. Well, there are the inevitable tuk-tuks or the somewhat larger songthaews, but I don’t think you see much from motorized transport, especially when you are concentrating on not falling out of the former, or not bashing your head while crouched in the latter. I spent my three nights in a place with the lengthy name of the “Lotus Hotel Pang Suan Kaew” but abbreviating this to “Lotus Hotel” didn’t seem to cause me any problems. The best thing I can say about the place is that it’s in a great location … oh, and that I got a really good deal on agoda.com. The hotel is on the northwest corner of the old city wall, so it was very easy to head out for some sightseeing. It is also connected to a 500 store shopping center, which meant that during the frequent rain showers I had somewhere to go, and also someplace to eat. Aside from that though, there wasn’t much to recommend it. Seriously in need of renovation. Hot water seemed to depend on the wind direction … or something. And the ten channels, with only one in English, on the tiny tube TV were a surprise and disappointment. So, I spent a little of Saturday and most of Sunday nosing around the Wats, and enjoying some Thai food. Late Sunday I found a night market on Ratchadamnoen Road … a major thoroughfare through the center of the city. I never could quite figure how to pronounce this, so ended up nicknaming it Wretched Demon Road. It worked for me. The market had a little of everything, and it would be possible to spend a whole evening, or evenings, wandering and bartering for all manor of things you’d never use. But being limited by AirAsia’s 7kg hand baggage limit, I had a good reason to buy almost nothing, but still enjoyed the experience. Early Monday, by which I mean before 8am (9 in Malaysia, and 9:30 in Newfoundland) I walked a couple of kilometers away from the city to visit Wat Chet Yot, or Wat Jet Yod, the spelling depending on something I never discovered. The history and unusual architecture scattered under the yawning canopy of ancient trees is an pleasant antidote to the flash and bustle encountered at popular temples. Yes, good description. And it covers quite a large area, so it would be possible to make a relaxed half-day tour of the place, perhaps taking in the nearby Chiang Mai National Museum. But, I had something else in mind. When doing a little research before my trip I discovered Mae Ping River Cruises and by e-mail I booked a lunchtime cruise. For me, this was the highlight of the trip. The company picks up and drops off at all local hotels, and with the river being on the opposite side of the city from my hotel, this was much appreciated. The tour takes travellers about an hour north of the city, well away from the hustle, bustle, noise and dust. The return journey seemed to be a little faster, I’m guessing due to the natural flow of the river. One thing that surprised me was the lack of any river traffic other than the few cruise boats. I would have thought some barges would be an ideal way to transport goods between the villages, and the up-river hotels could use ferries to take guests into the city. Strange. It was nice to see the fancy hotels and homes which line the river, but also the more primitive dwellings further north. Lunch, at a small farm house, consisted of the famous local noodle dish of Khao Soi, served with a meat of one’s choice. Very tasty. A nice way to spend, and end a day. Well, I had intended visiting a local pottery late afternoon, but never found the place. Such is life. So it was just a question of supper, beers, pack, sleep and a fairly early trip to the airport. Plus the small surprise that even though the Lotus Hotel has a free airport pickup service, they charge to take you back. A nice way to say “don’t return.” I won’t. If Chiang Mai was your first destination in Thailand, I think you’d be overwhelmed. It certainly has that Wow Factor. 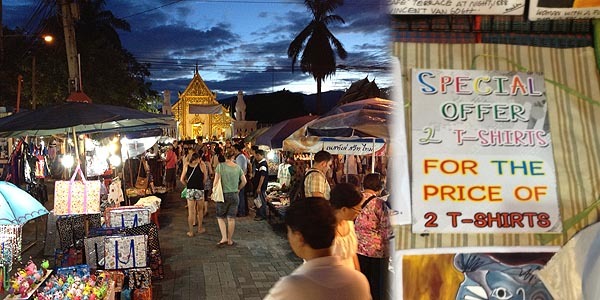 As a fairly regular visitor to Thailand, I found Chiang Mai to be very pleasant and interesting, and I’d happily return. In fact, I’m sure I will return so that I can visit Doi Suthep, it’s monastery, the nearby Royal Palace Gardens, the many surrounding hill stations and hilltribe markets, plus the parts of the city I missed. That could take a week. But only in the cooler and dryer winter months.